The Pelikan Souveran M805 Vibrant Blue, a special edition pen for 2016 is now in residence at Penbox, and on display in the Pelikan pen tower. We also have the pens featured on the Penbox web site at M805 Vibrant Blue. 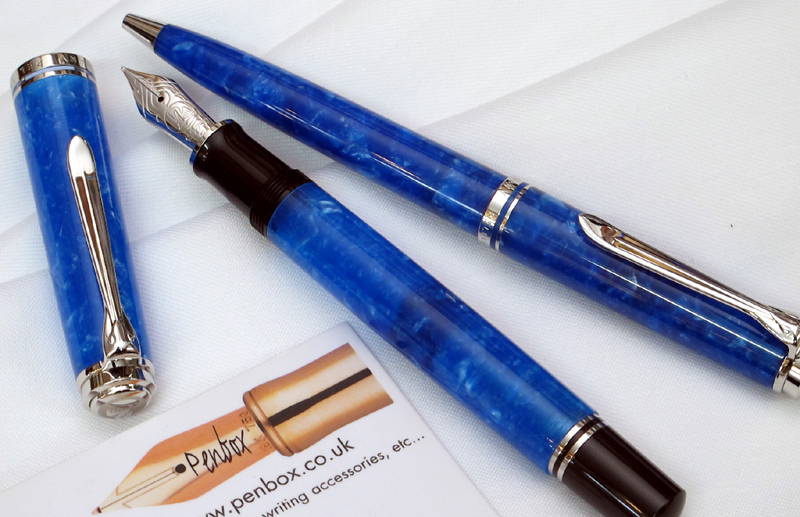 The combination of variegated blue, pearl, and palladium results in an aesthetically pleasing range of fountain, rollerball and ballpoint pens. The fountain pen being fitted with an 18k rhodium plated nib available in a choice of EF, F, M or broad grades. The new Special Edition Pink M600 Pelikan Souveran fountain and ballpoint pens have now taken their place in the Pelikan show tower at Penbox. The fountain pen is available fitted with a choice of 14k nib grades (EF, F, M, B). This bright new addition to the Pelikan Souveran range is certain to appeal to the ladies. The 600 pink is also presented in a special gift box that is a perfect fit with its feminine design. 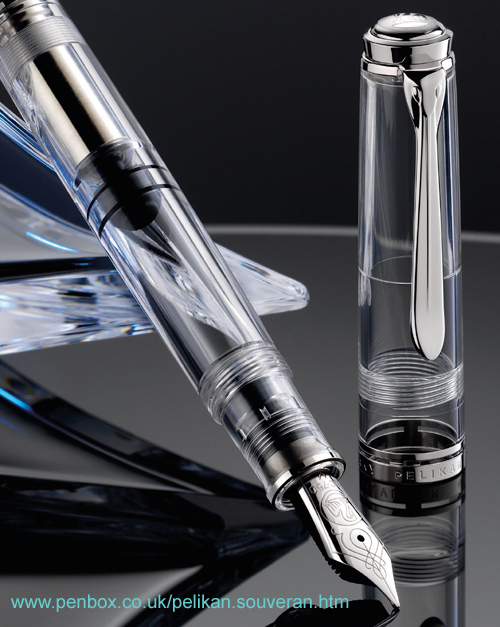 The M1000 Pelikan Raden Starlight fountain pen has now been added to the Pelikan pens on display at Penbox. We normally see stars as lights in the night sky, but with the limited edition Raden Starlight you can see clouds of stars on the barrel and cap of the pen. If you look closely, red giant, nebula and white dwarf stars can all be found beneath the multiple layers of rich lacquer. 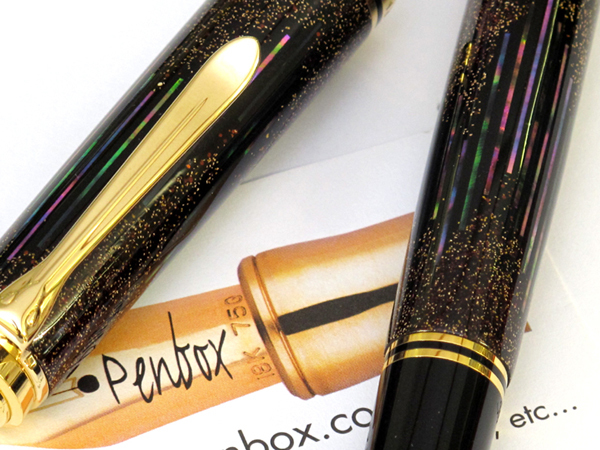 Available from Penbox in a choice of 18k extra fine, fine, medium and broad nib grades. Only 333 examples have been produced. Penbox are now waiting for delivery of the much anticipated new Pelikan M805 Demonstrator fountain pens. Two versions of the pen are being produced, one being all clear and the other with engraving to illustrate the mechanism and features of the pen. Delivery of the first pens to the shop is forecast for April, and following the success of the M800 Demonstrator released in 2008, we expect this pen to be well received. Being a special edition, numbers will be limited. Special Edition Tortoiseshell Pelikan Souveran. 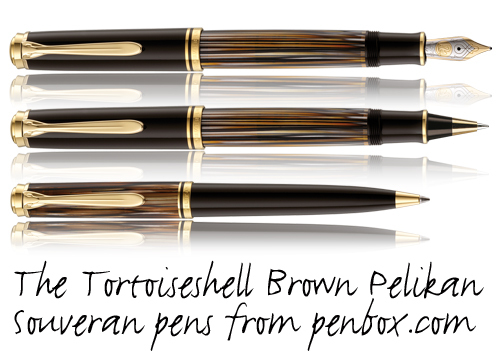 Special Edition Tortoiseshell Brown Pelikan Souveran Pens. The Special Edition Tortoiseshell Brown Pelikan Souveran fountain pen is now available from our online pen shop or in the pen shop at 14 Fountain Court, Market Place, Epworth, DN9 1EG, telephone 01427 874433, email: tortoiseshellbrown@penbox.co.uk, web: http://www.penbox.co.uk/pelikan.tortoiseshell.brown.htm . Launched in the first quarter of 2013 this tortoiseshell brown finish is available for a limited time only. 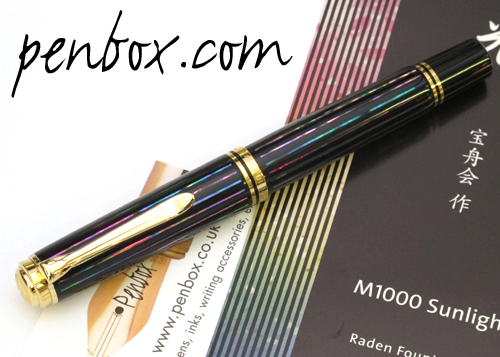 In late 2012 Pelikan pens released the limited edition Pelikan M1000 Raden Sunlight fountain pen and Penbox now have a few examples of this pen available. Decorated with abalone (mother of pearl), limited to 300 pieces and individually signed and numbered, these pens are likely to be as desired as the earlier (2005) M800 Moonlight (Gekko) and Sunlight (Kyokko) Raden pens from Pelikan. See Raden Sunlight for more information. Having been out of several colours for a while Penbox are once again stocking seven colours of the Edelstein ink from Pelikan. Edelstein (German for gem stone) ink was introduced by Pelikan in 2011 but supply of all colours has been a bit hit and miss up until now. However, for now we have seven colours in stock and will try to keep the website updated as to availability from stock. More information and pricing can be found on the Edelstein Ink page on the Penbox website.